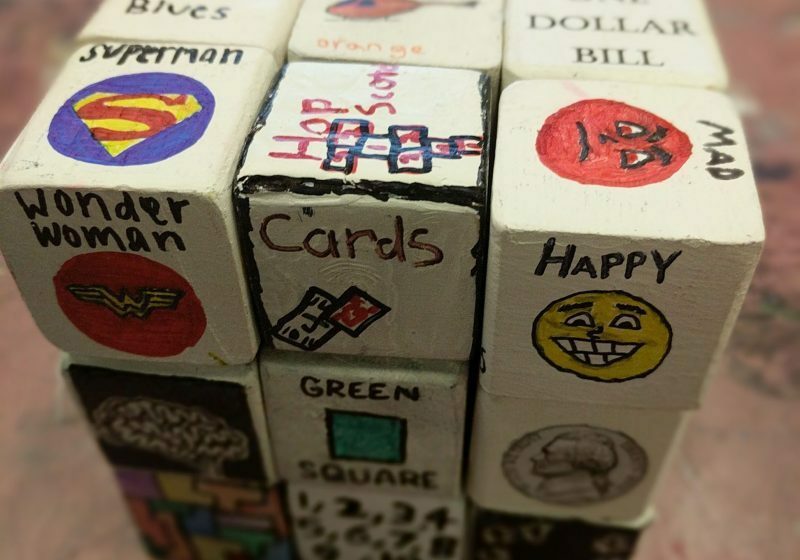 A stack of blocks that make use of emojis, pop culture symbols and bright colors is seen in 2017 at Father Ryan High School in Nashville, Tenn. Art teacher Mike Mitchell, and Dr. Meg Benningfield, a child psychiatrist at Vanderbilt University, worked together to have art students create blocks depicting different emotions to be used in children's counseling sessions. (CNS photo/courtesy Father Ryan High School) See SCHOOL-VANDERBILT-MENTAL-HEALTH March 12, 2018. NASHVILLE, Tenn. (CNS) — Projects evolve in different ways. Mitchell teaches at Father Ryan High School and Benningfield is medical director of the Vanderbilt School-Based Mental Health Services, Division of Child and Adolescent Psychiatry. The two have been close since their children started kindergarten together six years ago. “He and I have talked for years about ways we could collaborate to support educational development and social emotional growth in our communities,” Benningfield told the Tennessee Register, newspaper of the Diocese of Nashville. The goal of the partnership was to help therapists working with young children by creating blocks with images of various feelings. The therapists would then share the blocks with their patients to support them in communicating about their emotional states. Mitchell had previously done an educational art project geared toward helping English-language learners in a first-grade classroom at a Nashville public grade school he attended growing up. At Father Ryan, each participant in Mitchell’s 3-D art class made one block that contained six pieces of information that might be useful for a student learning English. As a child psychiatrist, Benningfield often sought new ways to incorporate play into her work. 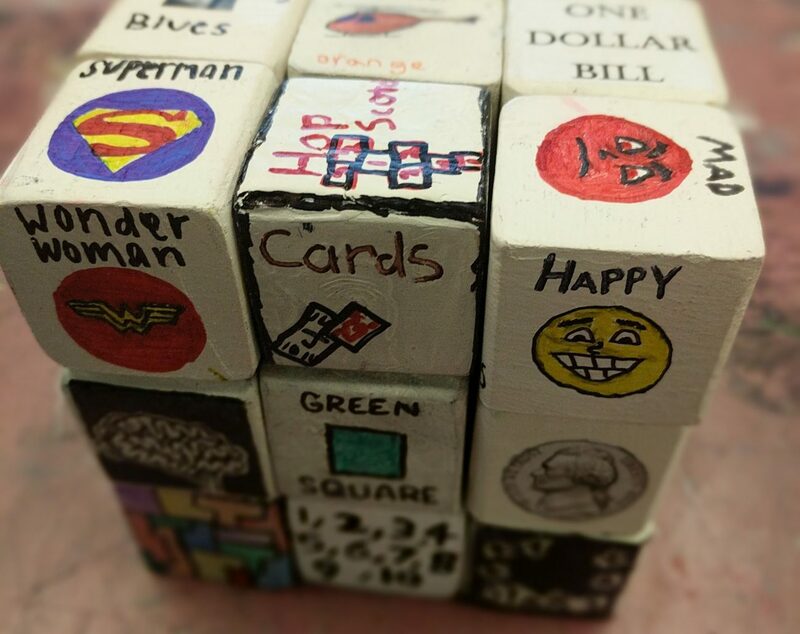 She and Mitchell came up with the idea of using blocks that could be used as “feelings dice.” They selected six basic emotions that are most commonly expressed across cultures: happy, sad, angry, disgusted, surprised and afraid. According to Benningfield, this is a basic principle of cognitive behavioral therapy, an evidence-based treatment for anxiety and depression. This therapy teaches that if individuals can change the way they think about a situation or the way they respond or behave, they also might be able to alter the way they feel. Different emotions were represented by emojis printed on paper and then decoupaged onto wooden blocks. It was a true team effort, with the students significantly involved in the project’s development as well as the final product’s design. When Mitchell’s class finished making the blocks, they were delivered to Benningfield, who in turn gave them to the second-year child psychiatry fellows in the clinic, physicians in their final year of residency training. Another benefit of the blocks, Benningfield said, is that a child can take something home from therapy that can be a “transitional object,” reminding the child of his or her relationship with the doctor and the work they’re doing. “Transitional objects are reminders that the caregiver is still there even if they’re not present with the child in this moment,” she said. For Mitchell, the hope was that his students would recognize how design and art can have an impact on someone else’s life. “I do think they understand that what they made will help others better understand themselves,” he said. 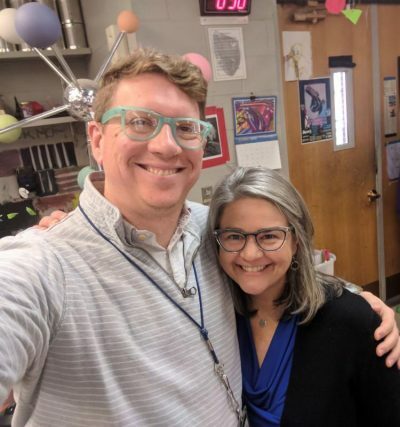 Mitchell would like to see his 3D class become an art and design studio that extends beyond the walls of his classroom, which can positively impact the Nashville community at large. An extension of the work has already begun. Benningfield, Mitchell’s art students and Rhonda Jones, head of Father Ryan’s counseling department, are initiating plans to create blocks with textures that will be utilized in therapy counseling settings both at Vanderbilt and Father Ryan.